When people sustain a femur fracture, they may be surprised to find out that they needed physical therapy to assist in their recovery process. While some people may be skeptical that they need physical therapy, almost everyone who requires surgery to repair a femur fracture will need physical therapy in order to regain use of their leg. Physical therapy can help to expedite the recovery process, leading to restoration of standing, walking, and running in a shorter period of time. How exactly does physical therapy do this and why is it needed? How Long Does Physical Therapy Last? What is the Typical Exercise Progression? Most people are aware that bone fractures, including a femur fracture, will take several weeks to heal; however, this is just the time period for the bones seal together properly. In reality, the recovery process after a broken leg is just as much about preventing re-injury as it is about solidifying the remodeled bone. Physical therapy can help make this goal a reality in several ways. 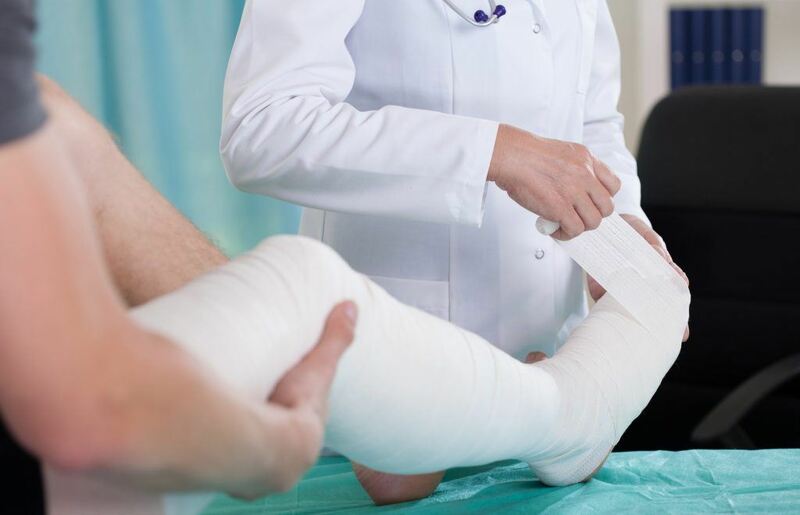 When people sustain a fracture, the bone heals enough to withstand typical wear and tear; however, the bone will never regain the strength that it had prior to the accident. In order to strengthen the bone against another traumatic injury, physical therapy will focus on strengthening the bone. Physical therapy will focus on loading and unloading weight on the bone, telling the body that the bone needs to be strengthened. Part of resisting trauma is having the muscle strength around the bone to perform coordinated movements in a flexible manner. For this reason, the muscles around the bone must be strong. These muscles help to bend the bone, load the bone, and resist forces that might injure the bone. Physical therapy will focus on muscle contractions that will help to strengthen the muscle groups around the site of the femur fracture. After surgery, people will remain immobilized for an extended period of time as the tissue is given time to heal. During this time, it’s not unusual for muscle groups to atrophy because they aren’t being used. When people try to use their leg again, they may be surprised to realize that even simple movements are difficult because the muscles have stiffened and atrophied over time. Physical therapy will help to teach the muscles how to perform these movements again, helping people learn how to walk on their recently healed leg. Surgery is a traumatic experience for the leg and the tissues that surround it. The scars from surgery need to heal from the bone to the skin. Physical therapy will help to stimulate this tissue healing process by increasing blood flow to that region of the body. When the leg is stimulated through physical therapy, the body responds by sending blood, oxygen, nutrients, and cells to that area. These substances will help the body to heal faster, leading to a shorter recovery time. One of the biggest risks for re-injury is falls. When people are learning how to walk again after a femur fracture, they may feel like a toddler learning how to walk for the first time. The only difference is that when toddlers fall it isn’t on a recently healed broken leg. In order to prevent people from breaking their leg again due to falls, one of the major focuses of physical therapy is making sure that patients have a strong sense of balance. To improve a patient’s sense of balance, physical therapists will use several exercises and equipment to both strengthen the muscles surrounding the broken leg while helping patients to shift balance from their uninjured leg to their injured leg and back again. A common place for patients to fall is when they transfer. This means transferring from the bed to the floor, transferring from the floor to the toilet, and transferring into and out of the bathtub or shower. Anywhere that a patient may go from laying down to sitting or standing is a potential location for a traumatic injury. Physical therapists will help to teach patients how to safely transfer between these different positions to ensure that there is as little chance as possible for patients to get injured. Clearly, there are many benefits to physical therapy. Many patients are wondering just how long they will need to attend physical therapy for. The simple answer is that it depends on several different factors. How Bad was the Injury? This is the most important question. The duration of a patient’s physical therapy session is going to depend heavily on how bad their fracture was. For patients that didn’t need surgery, their fracture likely wasn’t as severe. Therefore, their physical therapy session will be shorter. Other patients may have had a complete break that led to a major surgical procedure. These patients can expect to spend more time in physical therapy. What is the Patient’s Insurance Status? Unfortunately, this is another factor involved in the patient’s recovery process. Some patients may only have enough health insurance for a few visits. If these visits are exhausted, patients may need to cut their therapy session short or pay for their sessions out of pocket. These issues are handled on a case by case basis. Overall, most patients will attend physical therapy either two or three times per week for an hour or two depending on how long they can last during the physically demanding sessions. Then, this routine will go on for a couple of weeks to a couple of months depending on the patient’s progress. When patients are recovering from a femur fracture, there is a general progression that patients can be expected to follow. This is the first exercise that most patients will engage in. This will start immediately after the surgical procedure (if the patient had one) and serves a couple of purposes. First, patients are immobilized in bed after the procedure and are prone to forming blood clots. This exercise helps to prevent this. Also, the exercise helps to stimulate the muscles in the ankle, helping to prevent muscle atrophy. When the patient is able, physical therapy will proceed to isometric contractions. These are contractions that do not involve limb movement, such as flexing a muscle without actually moving the limb. This will help to load the muscles in the leg, helping to strengthen them while also preventing further atrophy. Eventually, the patient will be able to move their leg. First, the patient will be asked to move their leg with gravity. This is the first step in regaining motion and helps to minimize stress on the leg because the patient isn’t moving against gravity. As the patient starts to regain strength, the patient will be asked to move their leg against gravity. This is going to be harder due to the added force of gravity; however, it is important that patients demonstrate an ability to perform these exercises prior to starting to walk. This will also help to strengthen the muscles that will be used when the patient starts to walk again. Range of Motion: Because the patient has been in bed for a long time, they may have lost range of motion in their leg. The physical therapist will help to improve flexibility and restore this function. Balance: Without a doubt, patients have lost their sense of balance while lying in bed. Patients will be asked to (carefully) balance, re-educating the patient’s muscles and restoring their center of gravity to its rightful place. Flexibility: Part of range of motion and balance is improving flexibility. If the patient is more flexible, their muscles and bones will be better equipped to deal with traumatic forces in the future. This is essential in preventing re-injury to a broken leg. Prevention of Edema: Edema is the medical term for swelling and if the femur fracture swells up, it can hinder the progress of physical therapy. Therefore, physical therapists are well-equipped to teach exercises that will minimize the development of edema. I’m Ed Smith, a Sacramento Bone Fracture Attorney. Many people need physical therapy to repair a broken leg. Anyone who has sustained a femur fracture should call me at 916.921.6400 for friendly, free advice. I am a part of the California Million Dollar Advocates Forum. Our group is made up of some of the top trial lawyers in the country who have won verdicts worth more than 1 Million Dollars. Read some of my prior verdicts and settlements. Past clients reviews are available on Avvo, Yelp, and Google.